Abraham Prescott was one of America’s most influential bassmakers. Barrie Kolstein explores his history and instruments. 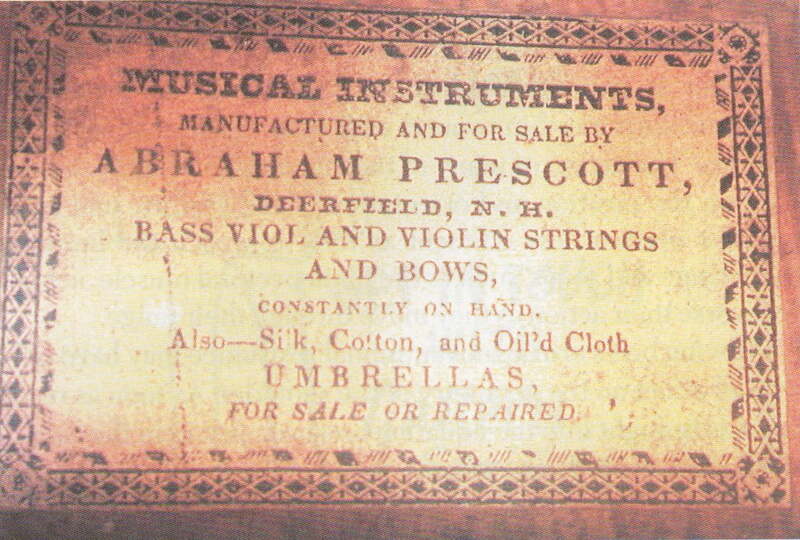 One of the greatest icons of American violin making, Abraham Prescott, was born on 5 July 1789 in Deerfield, New Hampshire, US. Prescott’s early association with the church, combined with the influence of his family’s woodworking business, inspired him to begin making musical instruments in this rural New Hampshire community. As the musical literature of the church grew, so did the demand for accompaniment instruments such as the church bass and reed organ. Prescott became adept at making both such instruments. 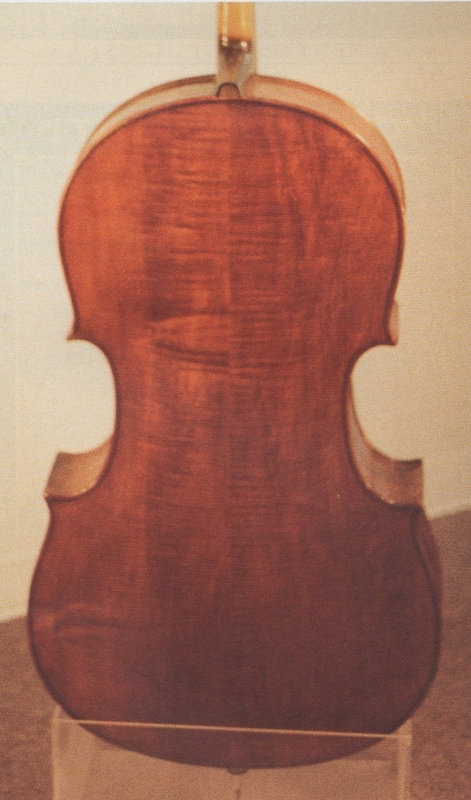 His first bass of saleable quality was documented as being completed in 1809 and sold to Jonathan R Cram. However, Prescott’s vocation as an instrument maker was interrupted by other pursuits such as his education, farming duties and a career as a school teacher. While working as a teacher he continued manufacturing instruments, eventually opening a store in Deerfield. He not only completed several basses at this time but also made and sold household sundries. Record books show that his basses sold for around US$15 per instrument. Prescott eventually established himself more formally as an instrument maker, while still continuing his teaching duties. He sold throughout central New Hampshire, peddling his instruments with such strong and friendly salesmanship that he gained the nickname ‘Deacon’ (a lay officer of the local parish), though he never held that position with any of the congregations he visited. The church bass was an ideal product for these small places of worship, as many could not afford an organ and some congregations were too doctrinally strict to allow one. The church bass was just what was needed to reinforce the choir- based music of the service. As demand for instruments grew among local dealers in the Boston area, the Prescott shop continued to expand. James Prescott, Abraham’s relative and later father-in-law, joined the business and took responsibility for varnishing all the completed instruments. In 1822, a young apprentice by the name of David Dearborn, aged only 12, joined the shop. The business continued to grow extensively until in 1825, Abraham retired from teaching and devoted all his time to the shop at which point he hired Dearborn’s brother, Andrew, to join him as well. This time was one of the most prolific periods of completion for basses and cellos. 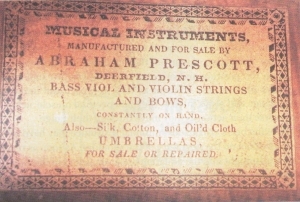 Increased popularity of Prescott instruments, both with players and major New England dealers, meant that bass prices had risen to US$50 per instrument. However, the shop’s records show that most of his transactions were based upon barter rather than monetary sales. Nonetheless, this form of remuneration still allowed the business to grow and Prescott decided to relocated from Deerfield to a more advantageous position in New Hampshire’s capital. Concord. Better river and eventually railroad transport, as well as a larger population influenced his decision to move. The transport improvements also simplified delivery to such major cities as Boston, Massachusetts. Prescott’s new shop on the corner of School and Main Streets in Concord was formally opened in 1831. However, the Dearborn brothers remained in Deerfield and created instruments under their own name, dissolving their partnership with Prescott Deerfield operations in 1837. The larger location allowed more employees and enabled more efficient production methods. Some arching and graduation of the tops, creation of the back tables (both swell and flat- back), carving of the scrolls, assembly of the basses and varnishing were accomplished on an assembly line. To step up production, Prescott designed tailed necks, whereby the necks and blocks of the basses were designed in one piece. The upper bout ribs were then inserted into this integrated neck and block. 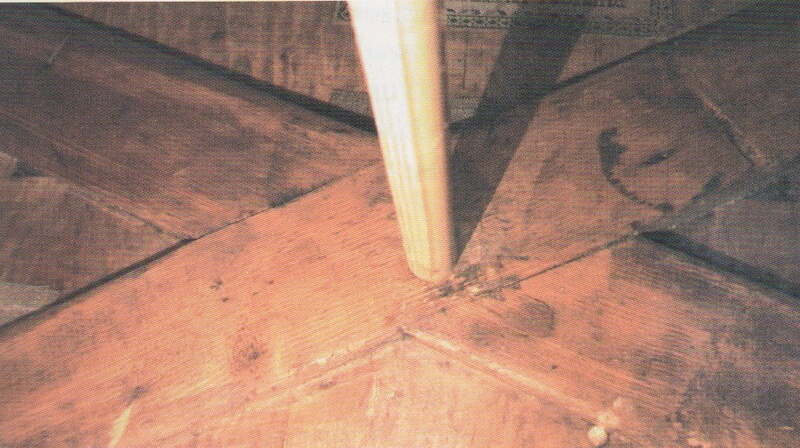 Back tables were often made with an inlayed channel, into which the ribs were bent and inserted. This eliminated the need for an interior form and once again increased production of these instruments. In addition, Prescott designed the flat- back, plus a non-traditional cross bar design, that literally formed an X shape. This allowed the sound post to be positioned on the cross of the two bars in this formation. The instruments were also designed with jointed F-holes that kept their wings attached to the top. This provided structural stability to prevent sinking when using center sections that were quite thin in graduation or thickness. The original design of the jointed F-hole in many Prescott examples has been altered so that the holes are cut through in a conventional manner. This may be an attempt to remove the integrity of the Prescott ancestry, but in many instances it endeavors to create more tonal vibration freedom in the top tables. Scroll carvings were quite distinctive as well, with deep accentuated channeling from the volutes extending well into the center cheeks of the peg box. A back table of rock maple. Manufacture of the tuning gears was sub-contracted to a firm of jewelers in Pittsfield, New Hampshire. While there are many basses with four ‘real’ Prescott tuners, it is possible that he never made a bass instrument with more than three strings, in the Italian tradition of the time. Records do indicate that his shop added fourth tuners to existing Prescott instruments, however. Being the entrepreneur that he was, Prescott decided that he needed to control supplies as production increased. He opened an affiliate branch based in the sawmill that prepared wood not only for the Prescott instruments, but also for competitive violin making shops in the New England area. This endeavor once again brought together Abraham Prescott and David Dearborn, as they formed a partnership in the sawmill, located on Clinton Street in Concord. With his new factory established and running well, Prescott retired from making and decided his talents would be better served by traveling, to solicit orders and promote Prescott instruments at exhibitions. His efforts were met with much success, as the factory continued to grow. All four of the Prescott sons joined the business. The elder son Abraham James eventually became a partner in 1845, thus changing the name of the business to A. Prescott & Son, then eventually, A. Prescott & Sons in 1850. The nature of the Prescott factory changed radically in the 1840s. Basses became a decreasing part of overall production, with new derivations of keyboard instruments becoming the mainstay of the business. The direction eventually made the factory a major provider of assorted reed organs and related instruments. In 1849, the Prescott factory was destroyed in a devastating fire that eliminated much of Concord’s Main Street. It was rebuilt on the same site, but within two years a second fire destroyed it again. Ironically, Prescott, who by this point had retired from active business, decided to become an insurance agent to write protective policies against such mishaps. He remained in this profession until his death on 1 May, 1858. The Prescott shop continued, but at a less fervent level of production until its disbandment in 1917, and the Prescott name remained in business as a Concord piano store until 1919. The example basses I have chosen here exemplify two distinctive Prescott designs. The first typifies the orchestral basses that are a hallmark of the Prescott shop. This design is still in common use for higher caliber orchestral playing. It is a full-cut 7/8-size, flatback model with upper bout corners of Gamba shaped design and lower bout comers of Bussetto or Klotz design. The top table is highly arched with jointedF-holes and is a four piece sectional table of white pine (a top wood utilized by Prescott and common to most of his instruments). The back table is highly-figured rock maple, with ribs of matching character to that of the back table. The scroll is original of highly-figured maple and the neck, as with most Prescott instruments that have been restored to handle modern steel string playing, required a neck graft. 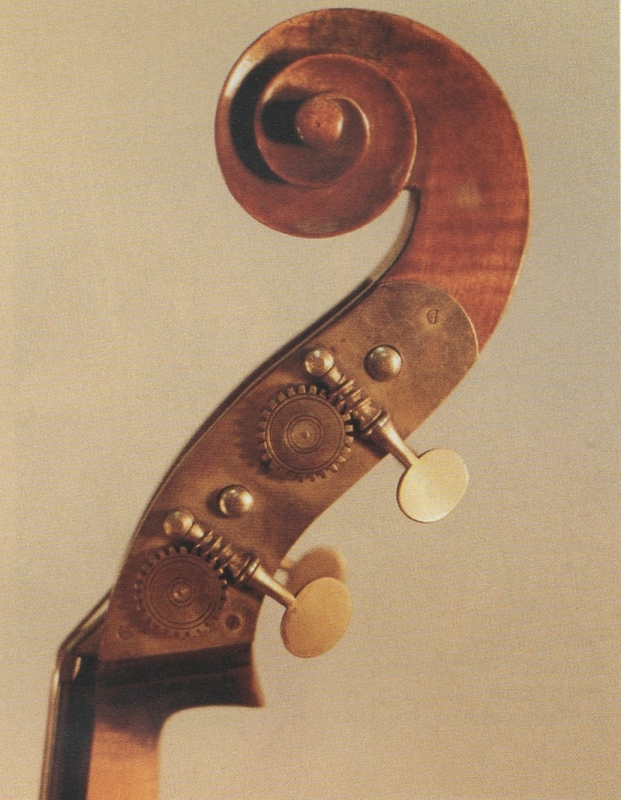 A spruce neck block has been installed into the body of the bass, although the original design would have featured an integrated neck and scroll design and no conventional neck block. The varnish is a deep, rich, transparent, reddish-brown color. This particular bass was converted from a three string to five-string design for full orchestral use. The bass is in the collection of Mr David Warshauer of the US. This second Prescott example is in my opinion one of the most pristine of his church basses. It is not much larger than a full-size cello. The workmanship is quite spectacular and certainly handmade, so one can deduce that this bass is an early example. It is between the conventional 1/2-size and 5/8-size and a swell back model with quite accentuated upper and lower violin corners. The top table is a two piece plate of fine quartered white pear, and highly flamed two piece sectional back table with matching ribs. An original scroll boasts delicate workmanship to the highest standard of Prescott’s work, with a moderate-flamed maple neck raft. The varnish is a pure, deep, reddish- brown color.